Look for the star~This series of novels are based on the United States Secret Service and introduces the elusive CAT guys. 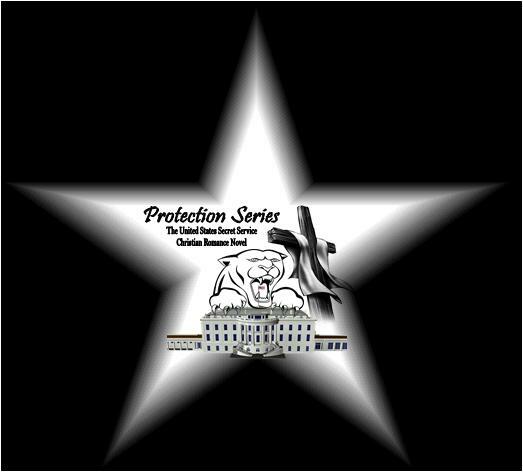 In regards to my first set of books that I am releasing, my Protection Series, they are based on the United States Secret Service. And they may be really different from what you normally read, but I am hoping that you enjoy the uniqueness and interesting situations that they all find themselves in and how Jesus heals their ways and works in each of their lives. The novels in this series do stand-alone; you do not have to read the first ones in order to follow the rest. However, they do relate to each other. There is a unique brotherly bond between the agents that you will meet. Each novel does stand alone, and you are not limited by having to read the first one to follow the rest. However, reading them in order will help introduce you to the lovable men and the women they allow near them, before you delve into their personal lives. You will laugh, cry, sigh and be inspired by them as you crawl into their protective lives and find yourself cheering on the heroic, strong women who make them even more protective. Those same women whose lives are uniquely held in the hands of Jesus which draws their men into a closer fellowship with their Savior. Enjoy your glimpse into a rare lifestyle that you would almost have to live in, in order to believe. #12~ The Secret Awareness of Protection. In the writing phase. #14~ Dwelling in the Fullness of Protection. #15~ The Healing Intimacy of Protection. #17~ The Devoting Presence of Protection. #18~ The Everlasting Joy of Protection. #19~ Safeguarding the Peaceful Existence of Protection. #20~ Embracing the Vital Breath of Protection. All of my books, as they are published, are available at Barnes & Noble, and other major retailers including ibook store for your iphone, ipods, etc. Smashwords does offer a kindle version, and it does work on the latest Kindles, including Kindle Fire (my friend just tried it on hers); instructions: Click on one of the links above (Smashwords.com), after you purchase/download using the mobi Kindle version, you then have to click “read online.” It is a little different because the pages scroll down instead of sideways. Another reader said that this is the way she reads with her Kindle (thanks Jasmine): Just in case any other Kindle owners are interested if you plug-in your Kindle to the computer and download the Kindle version and then drop it into the documents folder on the Kindle, it will read like all the other books. I have read all 11 books and loved them so much that I am reading them again,so I can write the spiritual wisdom in my journal. I have learned and grown so much through your amazing series. Thank you, Abba for the wisdom you allow to flow through Andie and her books. Praise King Jesus!!! Amen, Jan. Thank you so very much for this message and prayer!!! I am so excited you are loving them as the Holy Spirit guides you into reading them! Praise King Jesus, Amen… and again I say, Amen!!! May He release even more of His Truth through them as Abba intimately shows you something different every time you read them with Jesus!